After an amazing day of Macedonian cat-snowboarding at Popova Shapka, on a plump duvet of powder through perfectly spaced pines, we were back on the road. Next stop: Serbia. Months ago, back in a London flat, with maps spread across the floor, we had planned to sample the snowboarding in Brezovica, Kosovo. But after much reading and some email advice from those on the ground, we decided that we’d have to skip the troubled, newly-formed country that declared independence from Serbia in 2006. So, our crew of eight British snowboarders found ourselves back in our van, taking the long way round to Montenegro via Serbia, rather than taking the short cut through Kosovo. With iPods pumping out road-tripping tunes, we descend from the heights of Popova to the city of Tetovo, which sits at the foot of the Shar Mountains. Here we pass an intriguing marketplace; kitchen cupboard units sit on sale alongside brown rocks of salt, stuffed foxes and pyramids of pumpkins. There was once a cable car that connected this town to the ski resort above, but it was destroyed in 2001 during the conflict between Albanian Liberation Army militants and the Macedonian Security Forces. Though it's still marked on our map, the cable car no longer exists in the real world. It was a solid day of driving from Macedonia, with Danny, our designated driver at the wheel, and the crew taking turns to sit shotgun and navigate us north. We skirt around the Kosovan boarder, en route to the Serbian ski resort of Kopaonik, the biggest and most developed ski resort in the former Yugoslavia. The one and only motorway in the Balkans is surprisingly good. Largely empty, we cruise along the strip of two-lane tarmac that connects Macedonia’s capital – Skopje – to Serbia’s counterpart: Belgrade. The landscape is largely rural; muddy frozen fields, haystacks, and mist-soaked forest pass us by. Back over the Serbian border we stop for lunch at a road-side restaurant. Two, dirty-faced men wander over, one playing an accordion, the other a Turkish drum. They hold out their hands for money but all I have to offer is a few Macedonian coins. They don’t seem particularly impressed with my shrapnel, but pocket it anyway. Over a lunch of steaming goulash and dumplings, the manager of the restaurant is keen to chat. It emerges that he’s a keen skier and runs the local ski club. “I go ski whenever I have day off, it is just three hours from here.” He tells us. “Very good skiing – the best in the Balkans” he adds, as we settle our bill and clamber back into the van. Of course, he’s Serbian so he would say that, but we later find out that he may well be right. The roads become windy as we begin to climb again, up and into the mountains and on to snowy roads. 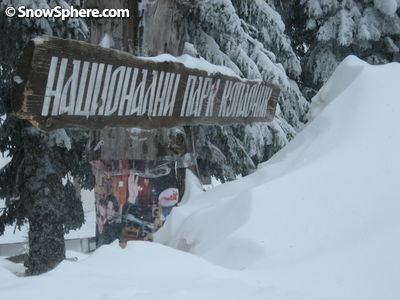 Men offer snow chains from roadside stalls, but we manage to make it all the way up to Kopaonik without fitting ours. Kopaonik – the best ski resort in the Balkans? 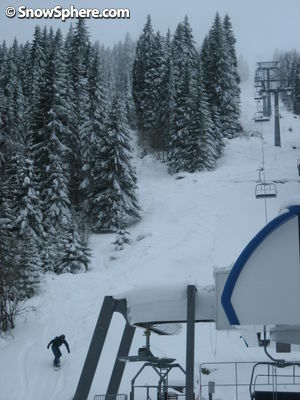 Kopaonik has seen considerable investment and is a far cry from what many people might expect to see in this part of the world. Indeed, a fast, efficient lift system speedily transports skiers to the top of forested runs, whilst glamorous hotels offer luxury accommodation in the village – for those wealthier Belgraders who can afford it. At the same time, the resort has not lost its rustic appeal. Little wooden huts, some even thatched, sit by the slopes. Inside on flag-stoned floors, skiers warm themselves in front of roaring log fires sipping mulled wine or strong Turkish coffee. Our base in Kopaonik is the newly refurbished Hotel Angela – a swish four-star operation, with friendly staff and modern fittings, and we’re made to feel at home straight away. We dump our gear and reconvene to explore the town, finding ourselves in a nearby bar called ‘Ski Schola’. It’s belting out a type of live music that is very popular in this part of the world: Turbofolk. A blend of Balkan folk music and Europop dance, to our ears at least, it doesn’t appeal much. One beer’s worth of Turbofolk is more than enough, and we move on to another, larger venue, where sexily-dressed Serbian bar maids attempt (and succeed!) to sell us test-tubes full of coloured spirits. But then, after just one beer, more live Turbofolk starts up! We call it a night, head back to the hotel, and hit the sack. We awake the next morning to a mountain completely hidden by thick mist. Heavy snow is falling and a foot of fresh has already landed. After a typically Balkan breakfast of bread and cold meats, we venture out into the storm to be greeted by the worst visibility I have ever snowboarded in. A complete and utter whiteout, you can’t see more than a few meters around. Riding in such conditions is a strange and unnerving experience. The ghostly shapes of other skiers melt in to the mist and it’s easy to lose your boarding buddies. With no contrast, it’s also impossible to tell how fast you are going, or even if you are moving at all. At one point I dig my edge in to stop for a rest. I believe I am now stationary, but then see a discarded coke can whizz past me, alerting me to the fact I am actually still in motion. The situation throws me right off balance and I hit the deck. So, we do the only thing you can in a whiteout: head into the trunks. 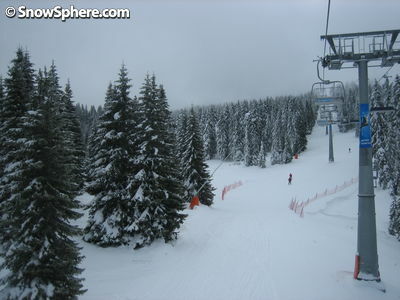 One thing Kopaonik is not short of is trees. The skiing here is at a relatively low altitude (1770m to 2020m) so most of the slopes have been carved through thick forest. 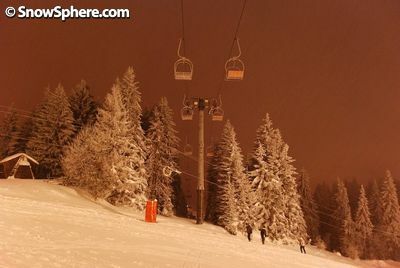 And it is here that the powder paradise of Kopaonik reveals itself. We blast through the pine boughs, leaden with snow, and glide through the Narnia-like scene. The terrain isn’t steep, but there is enough gradient to have ourselves a whole day of untracked Serbian powder. 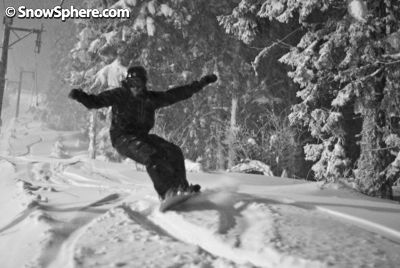 The visibility remains poor but as no other skiers or snowboarders venture into the trees, we enjoy fresh powder runs all day. 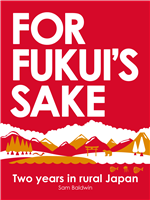 After a good day in the trees, we retire to the petite Kafka bar, where the kindly staff award one of our team a free top. They also point out a relic that clings to the wall – apparently it’s the first ever snowboard to have been ridden in Kopaonik. Following a brief rest, two of the SnowSphere team head back to the slopes to sample Kopaonik’s night-ski offerings whilst the rest of us find a rustic wooden restaurant, and sit by the fire with a Jelen beer each. They lap the flood-lit run but return with a strange story. They were approached by a man asking them to sign a petition. “What’s it for?” Chris asks. “To ban snowboarders.” Replies the man, holding out a pen. Needless to say, they don’t sign. We later met up with two local Serbian ladies (both named Olivera) from the Kopoanik tourist board who us show around. We start at Zerk restaurant, a wooden building with a giant fire place in the centre, where pot-roasted pork and lamb cook in the embers. Here we are treated to a feast of Serbia’s national dish: meat. This is supplemented with bean stew, cabbage, gherkins and peppers. As well as bottles of Serbian wine and Jelen beer. I ask Olivera 1 if she prefers Serbia as it is now, or when it was part of Yugoslavia. A three-piece band provide a traditional Serbian soundtrack to the evening and we eat and drink into the night, before finishing off in the town's UV-lit ten-pin bowling alley, where Olivera 2 reveals herself to be a kingpin (queenpin?) bowler. Despite both being mothers – the Oliveras show no signs of fatigue (supporting what we've already heard: Serbians are party hounds) and it’s us who eventually call time on the evening. Kopaonik impressed me. I had expected a smaller, flatter resort, and though it is by no means large when compared to some of the more familiar ski resorts in the Alps, there was enough terrain, and certainly enough snow, to make our stay a lot of fun. The lifts are fast, the people friendly, the beer and food cheap and the forested terrain beautiful. It would have been great to have stayed until the storm passed on and see the mountain in all it’s glory, but alas, we were only half way round our Balkan circuit and had to move on; the ski resorts of Montenegro beckoned.